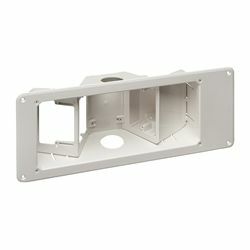 This recessed three-gang outlet box makes it easy to put a flat display flush against the wall by providing recessed and angled sockets for your single-gang duplex outlets. Plugs and connections stay behind the wall's surface, so you really can flush-mount a TV. Have electrical outlets installed or run low-voltage lines through the circular apertures. An interchangeable tray is included that can replace the dual single-gang holder to create space for a small digital converter. Duplex outlets and single-gang wall plates required, not included. Please note, National Electrical Code does not allow the installation of the TV power cord or an extension cord to be hidden in (behind) the wall. Have a licensed electrician install power outlets.